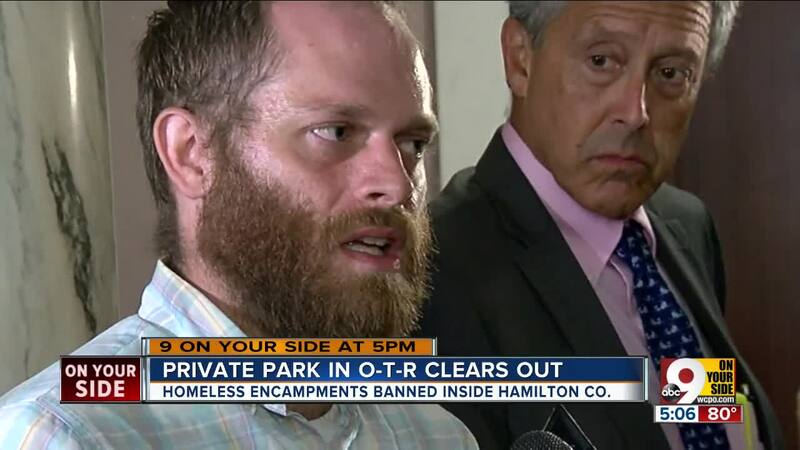 CINCINNATI -- People staying at an Over-the-Rhine homeless encampment left as promised Monday, but a leader of the group said they aren't gone for good. The remaining people at 13th and Republic streets finished packing their tents and belongings within hours of learning that the city of Cincinnati signed off on Hamilton County Prosecutor Joe Deters’ motion to permanently ban all encampments on public and private property countywide. The agreement gives Cincinnati police the authority to arrest people for setting up tents or tent cities, said Assistant Police Chief Paul Neudigate. But he said that’s unlikely. "We have not made a single arrest. Our intent is not to make a single arrest,” Neudigate said. “Cincinnati Police Department does not want to be seen as criminalizing homelessness, and that is not our intent." Homeless encampments in downtown Cincinnati have been in the spotlight since July 16 when city officials gave people staying in tents beneath Fort Washington Way 72 hours to clear the area. The city eventually gave notices to people living in tents pitched on sidewalks along Third Street, too. The people there moved their tents just long enough for the city to clean the area and then set up again. RELATED: What has tent city showdown taught Cincinnati? That’s when Cincinnati Mayor John Cranley asked Deters to intervene to help clear the camps, leading to a series of temporary restraining orders that culminated in the countywide ban. More than a dozen people from the encampments had pitched their tents on private property at 13th and Republic streets in Over-the-Rhine under the belief that they were in compliance with Hamilton County Common Pleas Court Judge Robert Ruehlman’s orders. The roughly 15 people remaining at the camp agreed to move today so as not to cause problems for Over-the-Rhine Community Housing, an affordable housing developer that owns the pocket park where they have been staying. One of the leaders of the camp, a man who goes by Bison, said just because the people are leaving the tent city doesn’t mean the fight is over. Bison said he has a voucher for housing, although he has not yet found an apartment. He won’t stop advocating until everyone gets the help they need, he said. Lawyers representing the people experiencing homelessness filed a federal lawsuit Aug. 3, arguing that the city’s efforts to clear the camps violated the constitutional rights of the people in the camps. 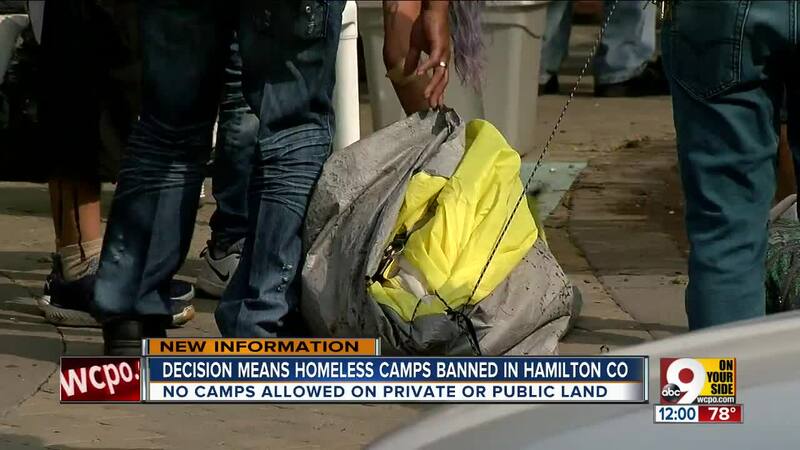 The lawyers added Hamilton County to the lawsuit after Deters filed his lawsuit against the city in state court and successfully argued for an expansion of the area where the camps were banned. Greater Cincinnati Homeless Coalition Executive Director Josh Spring, far right, holds an impromptu news conference Monday. Greater Cincinnati Homeless Coalition Executive Director Josh Spring said only two or three of the remaining people at the Over-the-Rhine camp have been able to secure housing; the rest have nowhere to go. "It's not hyperbole to say people are going into hiding," he said. "Folks living outside in Hamilton County both have a need and feel a need to hide from our city and our county." 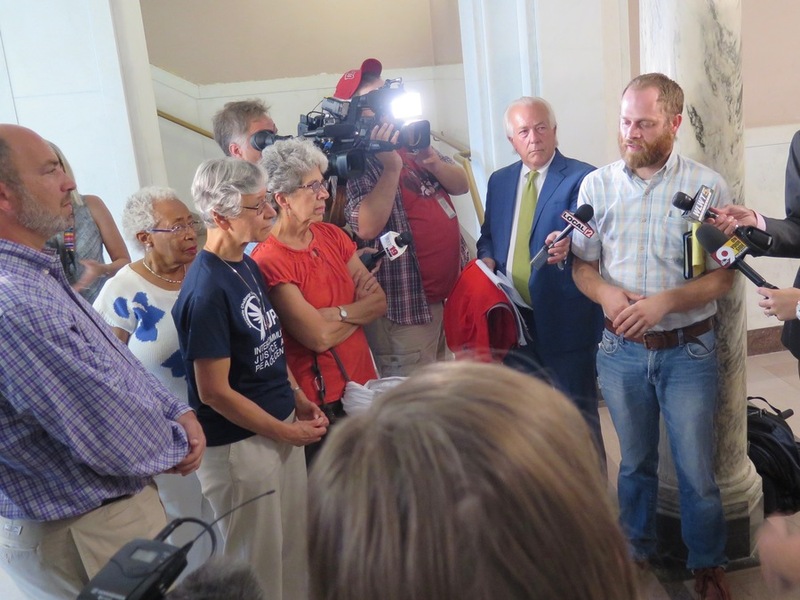 Settlement talks between city lawyers and the lawyers representing the homeless people seemed to be going well last week, said Bennett Allen, who is representing the people from the camps. But the city’s decision to agree to a countywide ban of homeless camps on public and private property sends a different signal, he said. “I thought we were going to work together to try to come to a resolution,” he said. Allen said the negotiations with the city will continue despite the ban but added that he and his clients haven’t decided yet whether to take any additional action in federal court. Having people from the encampment scatter to different locations will make it more challenging to stay in touch with them, he said, and will also make it more challenging for them to get help. “If you’re talking about people that need services, then chasing them off to place where they can’t be found is no way to provide those services,” he said.